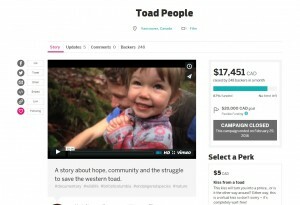 Toad People | Thank you to all the Toad People on Indiegogo! Although we fell a bit short of our financial goal, this crowdfunding campaign was a fantastic experience for the whole Toad People team. We have made great new connections, received valuable feedback and generated lots of support for the protection of western toads and other endangered species in BC. Now that the crowdfunding campaign is over, we’ll be getting right back into shooting and production so that we can complete the film. Once the film is done in late 2016, we’ll be hosting screenings in communities across the province and mobilizing people to join us in calling on the BC government to enact a provincial law to safeguard species at risk. 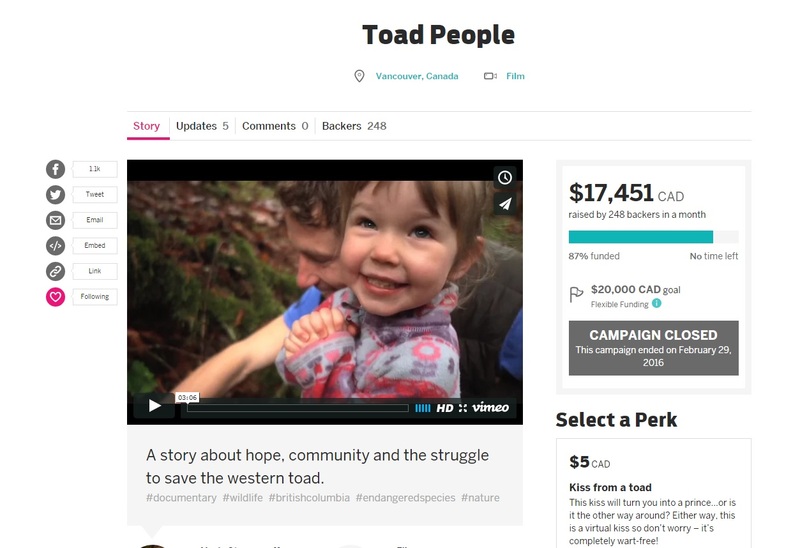 Thanks again to all the Toad People out there who have helped get us this far – from contributing funds to sharing the Toad People campaign with friends and family. Please stay tuned for more updates as we move ahead with the project!